Katrina Leno's inaugural book is coming out early next month through HarperCollins, and if you like thrillers, I cannot recommend it enough. The book is suitable for those over 13 which places it YA, but the twists, turns and dilemmas within can be fully appreciated by an adult audience. You will not want to put it down. Today, I am lucky enough to have the author herself give a glimpse of some of the inner workings of The Half Life of Molly Pierce. And, you know, some of it? The important bits? Not made up. Seriously, check her out, you will not regret it. You take it for granted. Waking up. Going to school, talking to your friends. Watching a show on television or reading a book or going out to lunch. You take for granted going to sleep at night, getting up the next day, and remembering everything that happened to you before you closed your eyes. You live and you remember. Me, I live and I forget. But now—now I am remembering. For all of her seventeen years, Molly feels like she’s missed bits and pieces of her life. Now, she’s figuring out why. Now, she’s remembering her own secrets. And in doing so, Molly uncovers the separate life she seems to have led…and the love that she can’t let go. 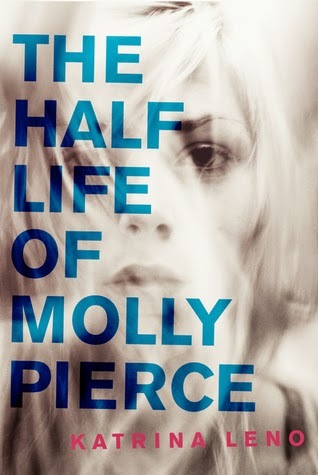 The Half Life of Molly Pierce is a suspenseful, evocative psychological mystery about uncovering the secrets of our pasts, facing the unknowns of our futures, and accepting our whole selves. This is how I remember it. Everything got very dark, very quickly. Sometimes I imagine my depression like a window. Just a plain window. A little older, maybe, so that sometimes it sticks when you try and open it. A single brass lock. A panel of clean, clear glass. White paint on the frame that’s been built up a little too thick over the years, so now it’s clammy and slick to the touch. White curtains, but surprisingly thick. When closed, the sunlight is fully extinguished from the room. The window disappears entirely. It might as well be solid wall. When I was twelve, the window shut. No more breeze. No more air. And not long after that, the curtains shut. They shut a little bit at a time over the course of several months. It was hard to tell they were even moving. Just one day they were open and the next day I couldn’t see anything. It was all dark. I went to the doctor for headaches. I said, before, this is how I remember it, because in truth—everything is faded. The doctor’s visit is like a story someone told me. It’s like it wasn’t even me. The doctor referred me to a psychologist, who then referred me to a psychiatrist, who then diagnosed me with a smattering of illnesses—none of which I had. I had depression, fully. The rest were misdiagnoses. I was swiftly medicated. This was the right decision, but it unfortunately led to THE WEEK I DON’T REMEMBER. That’s what I call it now, when I talk about it. THE WEEK I DON’T REMEMBER. I had an adverse reaction to the medication, had what might aptly be called a mental breakdown (at thirteen! I was a fast learner), and blacked out for the majority of a week. It’s weird, when I look back. These holes in my memory stick out. What did I do? What can’t I remember? Memory has always fascinated me because my own is so tenuous and unreliable. Because even when I finally managed to open the curtains, to crack the window, to raise it even higher—even now, when I am arguably better, able at least to control my depression so much better than the twelve- and thirteen-year-old version of myself, I still find it so hard to remember. To commit things to memory. I’ve just never learned how. I knew, when I wrote my first book, it would be almost autobiographical in the way it dealt with depression and mental illness. It is also a wholly fictionalized story. Nothing that happens to Molly Pierce happened to me. It’s just the feelings that are identical. What she feels is what I felt. Her words are taken from my journals, from my experiences, from my life. It is the truest account of my struggle with depression that I will ever be able to write. And it’s also made up. It’s the best balance I could find. I wrote THE HALF LIFE OF MOLLY PIERCE in three weeks—ten-hour days of writing that bled into each other and lost their borders and turned into one long, fuzzy day. I wrote a chronicle of my depression and gave it a plot, made up characters, inserted suspense. I wanted to get it all down correctly. It felt important to record it. It felt important to show people—see? Do you feel like this, too? Do you sometimes have trouble even brushing your teeth, because the curtains are shut and there is no light and you are, essentially, blind? Well you’re not alone. I’ve felt that way too. I’ve spent years feeling around in the dark for a window I know is there, but cannot see. To normalize depression, to normalize mental illness—to identify and treat and erase the stigma so inherent in this process—that is what I want. That is why I talk about my depression. That is why I write about it. To make it okay. To open the window. To try and remember. Wow, this is a really excellent piece about a time in your life that must have been terrifying and overwhelming. Great work, and good luck with your book! Ask a Teacher - What do you do all summer?